What can we expect from the Mets this offseason? There’s been a lot of speculation, but let’s try to make a deduction based on the information we have. The two main factors are available money and available players that match team needs. Before getting to the main topic, congratulations to Johan Santana. Before the season started, I expected this Mets team to be a laughingstock and on the wrong end of at least 90, if not 95 games. Instead of bumbling through another miserable season, the Mets are perhaps serving notice that 2012 is the season they turn the corner. The clubhouse culture has changed, there are promising young players both here and in the pipeline, some key veterans are finally healthy and playing time is being doled out on merit, instead of contract status or cronyism. The best part of the season was that it had been played without a peep from either Wilpon. Wow, what relevancy. What’s next, he’s in favor of sunshine at day games, shorter lines at the Shake Shack and no delays on the L.I.E? This reminds me of someone who while taking shelter from a rainstorm, sticks his hand out from underneath the cover to see if it is safe to come out again. Perhaps he is following the direction of some PR firm on how to repair his mangled image. “Go out and talk nice about David Wright, Jeff; see how people react.” Consider this a thunderclap, Jeff and please go back inside. Fortunately, Wright ended this useless speculation over the weekend, stating he will not re-negotiate a contract during the 2012 season. Back to Jeff. Remember, this man is the Chief Operating Officer of the Mets. In theory, only his father, who owns the team, has more power. Family ties apparently trump training, education or experience as qualifiers for the COO spot. Yeah, as the owners they can do whatever they want with the team, I get that. What makes it tough is how they continue to act like they think they can hoodwink perhaps the most wised-up fan base in all of the sport. 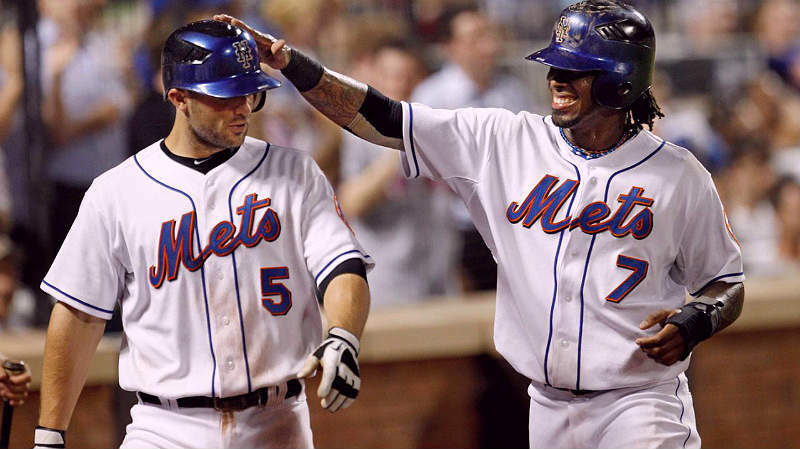 Did anyone else think those comments sounded a lot like the ones GM Sandy Alderson said last year about Jose Reyes? Does anyone else get the feeling that Jeff may be taking advantage of our distraction over the team’s play to wriggle his way back into the picture? Back in February, I was inspired to post that the Wilpons have a credibility problem. As was pointed out years ago here, even Jeff’s claim to have played minor league baseball is specious. The Wilpons are very successful in other areas, are probably very deserving of their wealth and have certainly supported some worthwhile ventures, but when it comes to the Mets, they just can’t seem to do much right. Look no further than Jeff’s signature COO project, overseeing the Citi Field construction. Notice that it has been nearly completely made over since its 2009 opening? Even worse, it was hinted anonymously that those horrific outfield dimensions were the brainchild of the since disgraced and departed Tony Bernazard. I wonder who leaked that? Despite the improved play, recent history shows the Mets to be a very combustible element. Most of their immolations these past few years occurred in late July and early August. Avoiding another one again this year is the big challenge facing Alderson and manager Terry Collins. That gargantuan task will only be made harder if a spotlight-jonesing owner’s son is crouching in the shadows just waiting to interject himself once more back into the center of the mix. So what to do? As Friday night showed, it is getting harder and harder to stay away from the product on the field. I have long been an advocate for a home-grown team. Well we have one now and I really like it. I can’t ignore them. We do however, have another option. Ever since this image-conscious regime went too far and broke up 1986-1988 Mets, they have never ceased fretting over public opinion. There was a passage in The Worst Team Money Could Buy about someone (I think it was Fred) opening the Post, the News, Newsday and the Times each morning to “see what those bastards are saying about us now.” Public pressure swayed them to trade for Mike Piazza. (Just ask Mike Francessa). More recently, look at how quickly they shoe horned in a Mets Museum and other Metsian trappings at Citi Field after the collective WTF over its debut as homage to the Brooklyn Dodgers. They pay attention. So, tell Jeff to shut up, sit down, and let the baseball people make the baseball decisions (there’s a concept). Sound off here, on Metsblog, the Met Home page, Twitter, WFAN, 1050, SNY, the papers, at restaurants, over beers, at the water cooler. Remind him again and again and again that we are both wise to and fed up with him. Has David Wright finally grown a backbone, and discovered a voice? Is he now ready to speak his mind, rather than provide diplomatic canned quotes? Are we going to find out who David Wright really is this year? COO Jeff Wilpon on Monday presented each member of the team with an orange T-shirt depicting the “U” symbol from the 1960’s TV cartoon “Underdog.” While most Mets, including manager Terry Collins, appeared to enjoy the stunt, Wright wasn’t thrilled. “I don’t really like using the whole underdog thing. I don’t really like playing that card,” Wright said. “I think it’s just a way to remind everybody in here that the outside expectations aren’t the expectations that we have for ourselves. Mr. Wright makes valid points. He also has blatantly poo-pooed an ill-conceived motivational tactic by his boss. The idea of the “Underdog” T-shirt in and of itself may not have been ill-conceived, but the fact it came from Jeff Wilpon destroyed any hope of it having an impact on the players. Stuff like that has to come from the players themselves — not from an outsider. And yes, the COO of a baseball team is an outsider. Sorry, Jeff, but that’s the way baseball teams work — you’re not “one of the guys”, you’re the boss, and therefore whatever you provide them as “encouragement” is seen as something forced, something they have to do. I wonder, Will Wright make more comments like this going forward? In other words, is he coming out of his “good boy” shell to say what he really feels, rather than try to fulfill the image of The Face of the Franchise? Could this change in behavior be in any way related to the rumors that Wright will be traded by July 31st, and/or the Mets’ inaction in regard to initiating a contract extension for Wright? Stay tuned, this could turn into an (under)dogfight. Mets Grab Geren – But Who is in Charge? 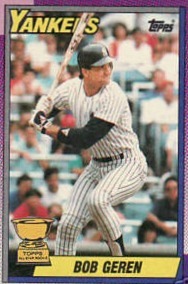 Big news in Flushing — the Mets have hired former Oakland Athletics manager Bob Geren to be their 2012 bench coach. The hiring comes as a surprise, since Bud Selig / MLB generally ask that teams hold off on huge announcements at this time of year, so that focus does not waver from the excitement of the postseason. But those brash and defiant Mets — who once almost wore illegal hats in a baseball game — laughed off such policy and came out with the news anyway. What? The hiring of Geren isn’t big news to you? Maybe because you’re still on the edge of your seat waiting to hear who the first-base coach will be. Or, maybe you’re more focused on whether the Mets will take advantage of their exclusive negotiating window and talk to the agent of a certain switch-hitting shortstop. 1. Terry Collins‘ choice for bench coach was his good friend Jim Riggleman. So, you could look at this as Alderson making a power play — though, not necessarily as an ego thing. I’m sure that Alderson genuinely prefers Geren for valid reasons, but the point is that ultimately, the Mets hired Alderson’s guy and not Collins’ guy — even though Collins is the one who will work most closely with the new employee. 3. Was Bob Geren really Alderson’s hire, or was it Jeff Wilpon’s? Further, was the hiring of a bench coach given to Alderson because Jeff had dibs on the hiring of a third base coach? Teufel is a longtime friend and trusted soldier of the Wilpons, and as such this promotion could be interpreted as a personal reward as much as it was one for performance. I know a lot of Mets fans would like to believe that Sandy Alderson holds the Mets future in his hands. Those of you who have that belief probably also think that Omar Minaya singlehandedly “destroyed” the organization. Maybe you’re right, but I have my own conspiracy theories, and would just like to point out little things here and there that could support my silly ideas (hey, with no Mets games going on, there’s a lot more time to dream up this stuff). There have been rumblings from “those in the know” that Alderson is already growing tired of “arrangement” that looms above him — and by that I mean the owners’ exercising their right to have a say in what happens with their company. A year ago, ownership was in a precarious position: they were in financial straits, were coming off two consecutive poor seasons, and had the Irving Picard suit looming. They were down, and they needed help. In response, Bud Selig sent Alderson in to Flushing on a white horse carrying a sack of secret cash to help turn things around. A year later, things are looking just a bit brighter for Mets ownership. For one, the Picard suit looks like it will cost them almost a billion dollars less than they thought. Further, Alderson has and is continuing to slash payroll. And, ownership seems to feel confident they can pull in a few investors over the winter. Those three developments have made the future look a bit brighter, and perhaps injected the Wilpons with just a bit of chutzpah. Why is this important? 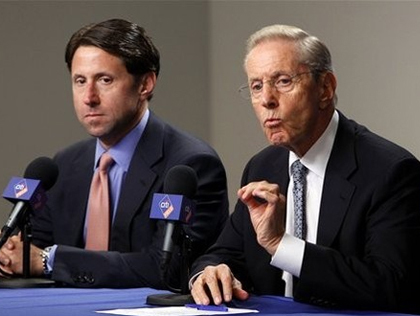 Because if they feel as though they’re “in the clear”, Fred and Jeff Wilpon are likely to go right back to doing what they’ve always done — which is, run the Mets. Again, that’s their prerogative — it IS their company, after all. For those who forgot, the Mets have been the Wilpons’ company exclusively since 2002, when they purchased the other 50% of the franchise from Nelson Doubleday (ironically, with some help from their good buddy Selig’s accountant, who Doubleday felt was “cooking the books”). The Mets record since the Wilpons took over complete ownership in 2002? 795-823, for a .491 winning percentage. In those ten seasons, the Mets won the NL East once, reaching the postseason once. They’ve been through 5 managers and 4 GMs in those 10 seasons. What do you think about this hiring of Bob Geren? Is it a clue to the beginnings of a behind-the-scenes power struggle? Or am I off my rocker creating conspiracy theories for lack of better content? Looking forward to your thoughts in the comments. According to multiple reports, Sandy Alderson will be meeting with Jeff Wilpon at some point this week in regard to the Mets’ opening in their front office. Hopefully, Jeff gets a haircut, wears his best suit, arrives on time, and speaks both eloquently and intelligently, so as to impress Mr. Alderson (you WILL address him as “Mr. Alderson”, won’t you, Jeff?). These may seem like trivial details, but considering that Jeff Wilpon has never had to experience a job interview before (remember, he’s had the luck of working in a family business), there is an off-chance that he blows the meeting. And it would be a catastrophe if Jeff comes off poorly, pushing Mr. Alderson to go back to his job of confirming birth certificates and fettering buscones in the Dominican Republic. Because if you hadn’t noticed, Richard Lynn “Sandy” Alderson is the Dixie Walker of Mets GM candidates — “the People’s Cherce” (Fred Wilpon should appreciate that moniker). MetsBlog has been singing Alderson’s praises since he became a candidate less than a week ago; Amazin’ Avenue seems to not hate him; all the Mets beat writers agree he’s the most qualified person; even BeelzeBud Selig recommends Alderson as the one man who can clean up the mess in Flushing. Those last two may be the strongest qualifications; who else appeals to both the old-school and Beane-head crowds, AND is accepted as competent by my dad (because of the ex-Marine part; Alderson could be a 98-year-old mongoloid with Alzheimer’s but as long as he spent time in the USMC, he’s the best man for the job)? In short, Alderson is a gritty, take-charge leader who understands the “new math” of baseball — and he’s a pretty good public speaker. Could there be a better candidate that appeals to all parties? If there is, let us know in the comments. You may have seen that the Chicago White Sox claimed Manny Ramirez on waivers. You may also have noticed that the Dodgers asked for absolutely nothing in return — the ChiSox took on Manny and the remaining $4M of his contract free and clear. I know, I know — it’s all moot now, since the Mets are a dozen games behind. But when Manny first went on waivers, Omar Minaya insisted the Mets still “had a chance” at making the playoffs. Without a shadow of a doubt, the one glaring issue holding them back at the time was a lack of offensive production. For all the baggage Manny brings to a team, he also brings a big bat. Even in his current underperforming state, he still would have walked into Flushing as the best hitter in the lineup. And getting him would not have cost a prospect, as so many fans had been concerned about. It would’ve cost nothing, in fact, except the one thing the Mets supposedly have: cash. But the Mets didn’t claim him. Therefore, Minaya lied about believing the team was still “in it” and Jeff Wilpon also lied, since he consistently insisted that money was not an issue. Because if indeed the Mets had money to spend, and believed they could still salvage September, Manny would have been a Met right now. On the one hand, it doesn’t matter because we all knew long ago that this team wouldn’t be playing October games. But on the other hand, it does matter because yet again the ownership and management has played us for fools. According to The New York Times, Francisco Rodriguez has completed his two-day suspension, has agreed to participate in anger management treatment, and will return to the Mets roster today. In fact, the Mets were considering a more severe punishment but settled on two games because the union agreed to the two games in consultation with Major League Baseball. The New York Mets today announced they are taking the following disciplinary action against pitcher Francisco Rodriguez: The team has placed Rodriguez on the restricted list for two days. He will be removed from the roster, will not be with the team, and will not be paid during that time. “Ownership and the organization are very disappointed in Francisco’s inappropriate behavior and we take this matter very seriously,” said Mets COO Jeff Wilpon. Once again, the Mets show their impotence, and cower to the opinions of others rather than taking the bull by the horns and making their own decision on a situation. If the Mets cared one bit about their “brand”, the team, their fans, Francisco Rodriguez, and Rodriguez’s family, the punishment would have been delivered harsher, swifter, and with conviction. But the Mets don’t have the chutzpah or the cojones to make a decision on their own, and don’t know what’s “right” until others tell them. Two days? Really? That’s “taking the matter very seriously”? And one of those didn’t count because it was spent in jail and court. And considering that Johan Santana and R.A. Dickey both pitched complete games, K-Rod didn’t really miss anything other than the $125K taken from his salary. 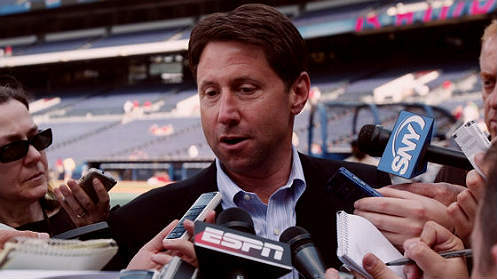 Jeff Wilpon had the opportunity to set the tone, to act as a potent leader, by acting swiftly and confidently. He could have said the Mets do not and will not tolerate such behavior on their property from anyone, and followed his “harsh words” with action — a one-month suspension, for example. Then, we wouldn’t have had to be subjected to the irrational comments of Jerry Manuel later that Thursday morning, who said he wouldn’t hesitate to use K-Rod if he were available. You can’t blame Manuel for saying such an idiotic thing, because the bosses above him were just as clueless and impotent as he was. Manuel wasn’t sure because Minaya wasn’t sure, and Minaya wasn’t sure because Wilpon wasn’t sure. And even if Wilpon wasn’t sure of exactly what he wanted to do, he still had a chance to appear firm. Instead of conferring with MLB and the MLBPA, the Mets could have immediately announced that K-Rod was suspended indefinitely, and then let the MLBPA file a protest against them. Maybe K-Rod would still wind up with only a two-game suspension, but at least the Mets take a stand for themselves and publicly show that they are more concerned with preserving respect for their organization than in appeasing everyone. Let the MLBPA look like the bad guys for changing the punishment to a mere slap on the wrist. The Mets said they were “disturbed by the allegations.” They said Burgos was in town for reasons unrelated to the team. How did the Mets react then? They didn’t. Burgos was still technically in the minors, recovering from Tommy John surgery. So, rather than address the situation — possibly by suspending him or arranging anger management counseling — The Mets did what they thought was best — they ignored the situation and waited for it to go away. 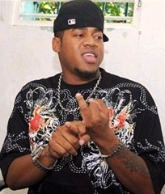 Eventually, it DID go away — Burgos went back to his home in the Dominican Republic and allegedly ran over two women with his SUV. Burgos wasn’t officially on the 25-man roster at the time, so it was a different situation than the present one. The Mets didn’t really “need” Burgos like they “need” K-Rod right now. Maybe Jeff Wilpon didn’t act swifty and with certainty because he feared losing more games without a closer, and in turn losing more ticket sales. One has to wonder: what if it was Oliver Perez who was arrested for assault in the Mets’ family room? Would he have been “punished” for only two days? Or would the Mets, MLB, and MLBPA agreed on, say, a 30-day, with-pay suspension so he could focus on “family matters”, psychiatric help, and anger management treatment?